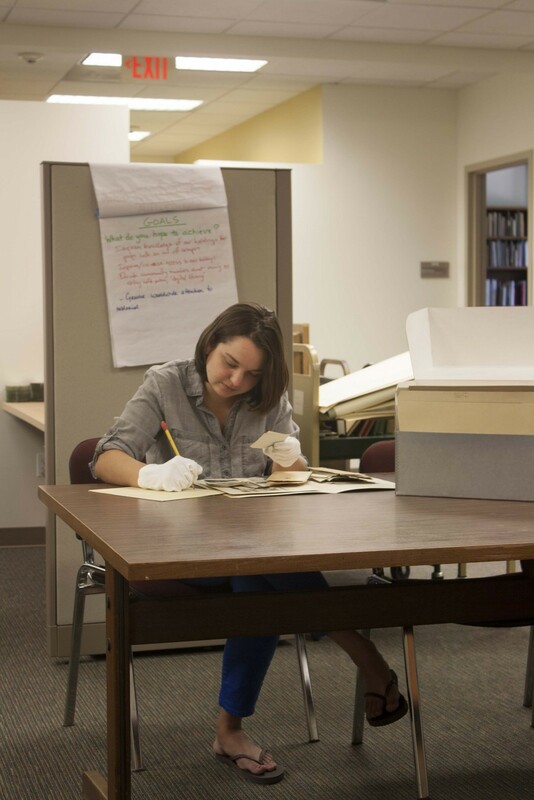 Elizabeth Reilly at work in Special Collections during Summer 2014. Diving into the world of Margaret Hall and all the other Bryn Mawr women who served during World War I has been wonderfully exciting and educational. At the beginning of the summer, not all of Bryn Mawr Special Collections’ WWI material was neatly categorized and processed. Part of my job, in addition to creating this digital exhibit, was to help create a comprehensive list of all WWI items in the College’s collection. Each day, I found something new that then led me down unexpected paths to other materials. The amount of information available on the internet is astounding and allows many archives to be accessible around the world. While I fully support these efforts to digitize, I still believe there is great value in physically handling objects. In the case of WWI materials, actually touching objects like 100 year old fragile photographs or diaries is fascinating. Reading and holding letters from a stressed student creates a different connection than simply staring at it on a screen. The texture or shade of original artwork can be difficult to convey on the web, which makes seeing it in person all the more important. This is especially pertinent for three-dimensional objects since the internet’s flatness hinders an accurate representation of them. Holding an American Red Cross pin is much more interesting than viewing it online. If I read Margaret Hall’s typescript online, my experience would have been drastically different. Instead, I turned the same pages that she turned, handled the book carefully and saw it exactly as she had designed it. Navigating and learning from archival collections online can be invaluable in our present digital information driven culture. But, they should be used alongside physical collections whenever possible. Perhaps I am partial to this view as a history major (just like Margaret was! ), but the past becomes much more interesting and relatable when you physically view objects that have survived over time. After immersing myself in WWI objects and reading various Mawrters' papers, it almost seemed like I knew them. I could easily connect with many of their observations, frustrations, and questions. In every type of research, it is likely that unexpected questions will arise which then lead you down new paths searching for answers. Working with primary sources housed in the same collection, as was the case with my research, can make connecting these dots easier. For instance, I found College News articles about alumnae, like Elsa Bowman, whom Margaret Hall mentioned in her memoir. I was able to pull Elsa’s file from the College archives, look her up in the Alumnae Quarterly publications and find her photographs. If I was doing research remotely and Googled “Elsa Bowman,” I would hit dead ends. Not only can it be difficult to find certain kinds of information online, many digital resources for history have already been processed and interpreted by multiple other people. Physically searching and rustling through papers allows you to create your own interpretations because you can see the object in its original state. You can direct a unique research journey instead of following suggested links on the internet. Finally finding a long sought after answer hidden in a crumpled letter is so satisfying and really validates your hard work. To be clear, I am not suggesting that either digital or primary research is superior rather that they are both valuable for different reasons. 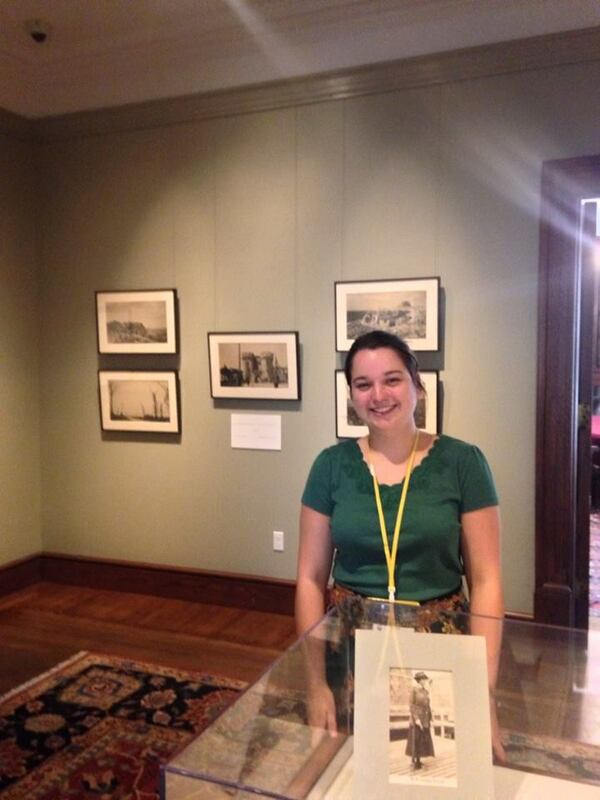 Elizabeth Reilly at the exhibit, Letters and Photographs from the Battle Country: Massachusetts Women in the First World War. I would like to thank several people who made this project possible. On one of my first days of work, Marianne Hansen took me down to the basement of Canaday library and handed me a bulky typescript with a pretty cover to read and then write a blog post about. I had no clue how in love with this project I would soon be. Marianne guided me throughout the project’s evolution and I am very grateful to her for giving me this opportunity. Eric Pumroy and Marianne also gave me the honor of being the speaker for the first iteration of the “Friday Finds” event series in Special Collections, which was an excellent way to share my research with the larger Bryn Mawr community. Thank you to Evan McGonagill and Monica Mercado for their helpful edits and Omeka guidance. Ondine LeBlanc, curator at the Massachusetts Historical Society, was very generous in welcoming me to the Society’s exhibit and talking about Margaret Hall. Upon my arrival, Ondine even surprised me with a copy of Margaret Higonnet’s brand new book, Letters and Photographs from the Battle Country: The World War I Memoir of Margaret Hall. As I often joked throughout the summer, I spent more time with Margaret and other Mawrters past than ‘real’ people, so thank you to my friends and family for listening to my stories. And, of course, thank you to Margaret Hall for creating and giving such a fascinating piece of history to Bryn Mawr College.